Many business professionals would have given anything for Bart Foster’s career. He was working for a Fortune 200 corporation—Kellogg Company—and became the youngest person to ever receive its “Golden K Award”, which recognizes the company’s Salesman of the Year. Foster left Kellogg’s four months later. Such is the restless soul of an entrepreneur. Foster left the security and comfort of his impressive position to seek out success on his own. 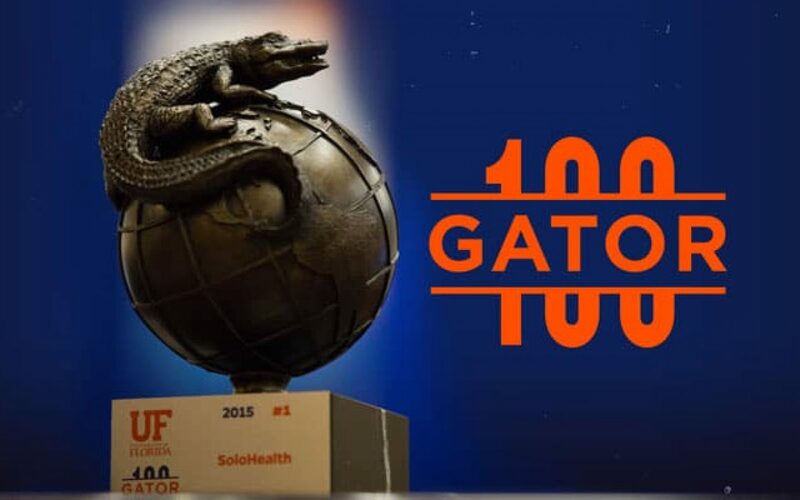 His gamble led him on an entrepreneurial adventure to SoloHealth, which finished atop the inaugural Gator100—a ranking of the fastest-growing Gator-led or Gator-owned companies in the world. Foster’s reason to leave Kellogg’s was simple: He didn’t want to have any regrets. So Foster (BSBA ’97) left the Kellogg Company to join Peachtree Network, an Internet grocery service startup in Montreal. Foster’s intuition to join Peachtree was right—online grocery shopping has flourished—but his timing was off. “The company was about 10 years ahead of its time,” Foster said. After about two years with Peachtree, Foster joined Novartis, a global healthcare company, in 2001. He became the company’s Director of International Sales & Marketing, and moved to England to lead the marketing efforts for CIBA Vision, Novartis’ eye care division. It was during this assignment that the makings of SoloHealth began. “I couldn’t sleep for two weeks,” Foster said. He constructed a business plan, and presented it to Novartis executives. They signed off on the plan, and gave him leeway for the next two years to devote time and resources to the project. Novartis’ executive management team was pleased with Foster’s progress and provided funding for another year of incubation. While the support and resources from Novartis were essential, Foster believed he could make SoloHealth succeed on his own. He acquired the intellectual property rights, and launched SoloHealth in October 2007. Early on, it seemed Foster’s move would pay off. He raised $1.8 million in capital and the company seemed primed for success. Then the financial crisis occurred. “It was a tough time for everyone,” Foster remembered. “My sleep patterns directly correlated with how much money we had in the bank. In addition to his conviction that SoloHealth would succeed, Foster received two big breaks to keep the company afloat. First, he received a $1.2 million grant from the National Institutes of Health. The NIH grant was a shock because— according to Foster—only 1% of all first-time applicants get funded. Second, his prototype began gaining traction. Major grocery chains like Walmart, Safeway and Sam’s Club agreed to house SoloHealth kiosks as part of a pilot program, which was a huge success. Today, SoloHealth kiosks are in more than 4,000 locations nationwide. The kiosks—known as SoloHealth Stations—screen users for a variety of health and wellness matters while providing an overall health assessment and educational information. SoloHealth, based in Atlanta, experienced a compound annual growth rate (CAGR) of 274.40% over the past three years. Profession: President, Gaiam, Inc. (NASDAQ: GAIA), Founder of SoloHealth, Inc.
Bart is now the President of Gaiam, Inc., a leading producer and marketer of wellness and fitness products based in Boulder, Colorado—where he lives with his wife, Aly (Mills) Foster (BSBA ’97) and their two children. He remains on SoloHealth’s Board of Directors and is the company’s largest independent shareholder. Bart raised more than $50 million in capital during his seven years at SoloHealth. Bart completed his first IRONMAN in Chattanooga, Tenn., on Sept. 28, 2014.